5. In this part of the sampler, Patterns are worked by combining the basic square herringbone in different ways. 6.In this part the square herringbone are worked over other stitches- Algerian eye, sheaf, buttonhole eyelet cup, detached chain, buttonhole square and half chevron. 7. 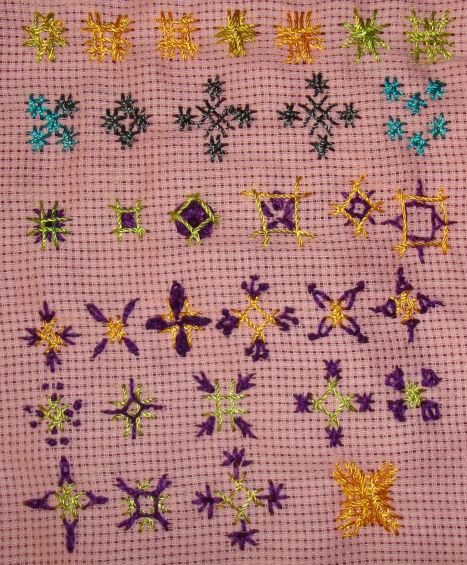 Some more stitch combinations were first worked on paper. 8.These were tried on sampler, the details of other stitches are- fly, detached chain, oyster, pistil, Italian border and triangular feather. 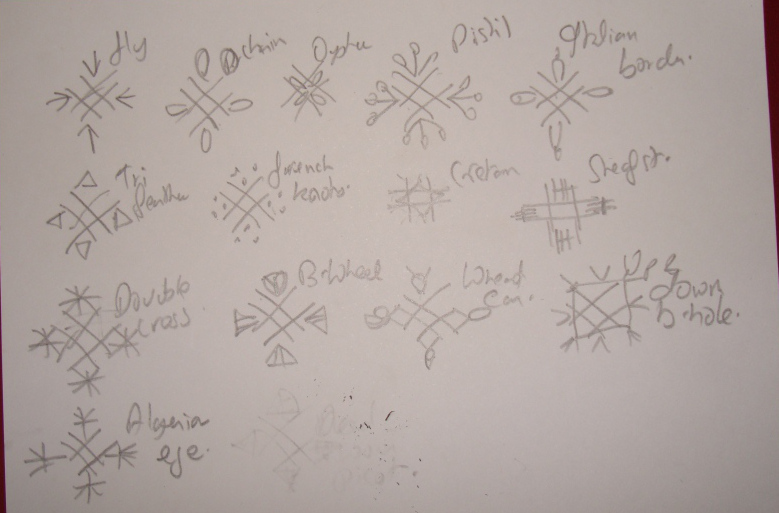 9.These combinations are- french knots, Cretan variation, sheaf variation, double cross and buttonhole wheel variation. The stitches on these samples are- wheat ear, up and down buttonhole and Algerian eye. The fourth one is formed with four square herringbone stitches. The square herringbone was an easy stitch and working other stitches with this stitch was interesting. 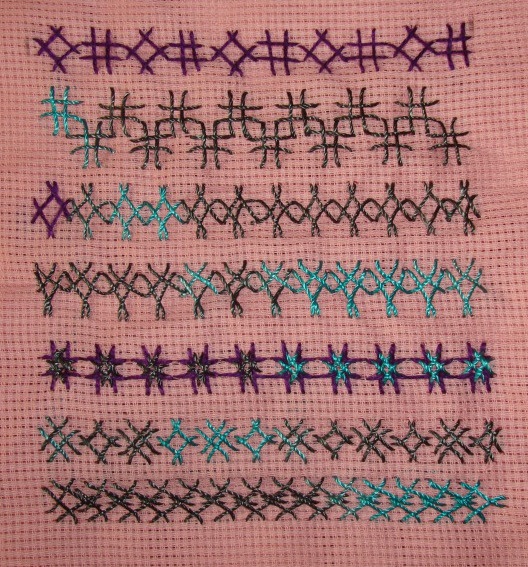 Helped in learning more about creating motifs with stitches. Muscat is celebrating it’s annual festival this month. We went to Naseem garden yesterday to watch the shows. The laser show and the fireworks were extraordinary, never have I seen anything like this in my life . The sampler did not progress much today. Just worked two square herringbone stitches, one over the other in different ways. This week has two stitches on the TAST 2013 challenge by SharonB. One is the basic stitch and the next one is the laced version. The first one is simple, I had tried this as a variation on my herringbone stitch sampler. Today I tried this square herringbone as line stitch. 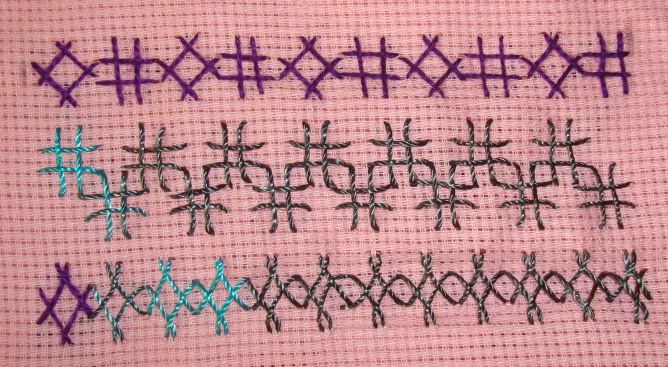 1.The square and diamond herringbone stitches are alternated in the first row .the square herringbone stitches are worked in two rows, this sample looks interesting. Long and narrow version of diamond herringbone are worked in the third row. 2a.The bottom part of the diamond herringbone are lengthened in the first row. The second row starts with square herringbone and small diamond herringbones are worked over it. Two versions of diamond herringbone are alternated in the first row. One side of each diamond herringbone is extended and the latter stitches are worked into the former stitches .This pattern forms the second row in this sample piece.